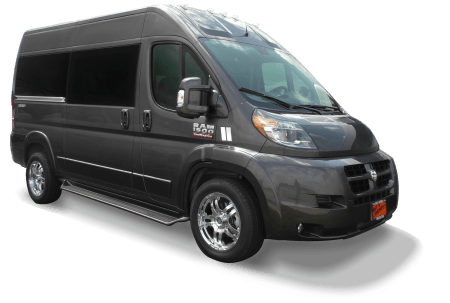 A Sherry RAM ProMaster Mobility Van is the absolute best options for custom mobility applications on the market today! We understand that each customer has unique requirements and budget, and we work with you every step of the way to ensure you get your ultimate mobility vehicle. 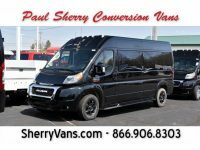 The Sherry Mobility van starts with the RAM ProMaster Chassis, it then gets our complete Sherry Conversion package including passenger seating and a luxurious finish. Finally we work with you to customize the van with the proper equipment to suit your unique needs. 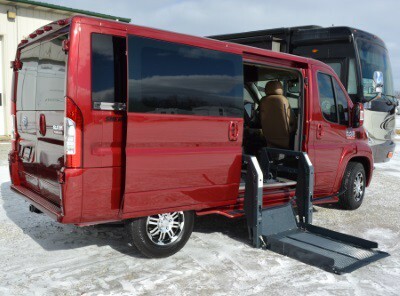 Per the request of the customer, we can customize a floor plan to make room for nearly any lift or additional equipment including hand controls, EZ Lock docking systems, transfer seats and more. 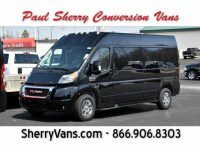 The Sherry RAM ProMaster Mobility van has much to offer that other mobility vans simply cannot match, and most importantly, we will make this complex process as simple as possible for you. This page is packed with helpful information for you to explore. Watch the video below for a detailed overview of one of our completed Mobility Vans. Call us at 866.906.8303 or simply fill our this form to get started today. The RAM ProMaster is the first full sized mobility van to offer 20+ MPG. Features that contribute to the impressive MPG are: 3.6L Pentastar VVT V6 Engine/3.0L Ecodiesel I4 Engine, Front Wheel Drive and Six Speed Automatic Transmission. Light, nimble and responsive, the front-wheel-drive system allows for impressive handling when navigating crowded city streets, parking garages or snowy roads. The front wheel drive system offers more than just on road performance. Using a front wheel drive system removes and usual rear wheel drive shaft connecting to the rear axle such as GM and Ford Transit chassis. From this difference, RAM was able to lower the floor to ground step-in height to just 21″. 50″ side door and rear doors that open 260 degrees offer many types and brands of lifts. If there is a specific lift you are looking for, please contact our mobility van service experts through our mobility van information request form. Because the RAM ProMaster mobility van doesn’t have a rear drive shaft, the RAM was able to drop the floor lower than any rear wheel drive van on the market. This makes entering and exiting the van easier than ever before! The RAM ProMaster mobility van offers full overhead storage throughout the rear cabin. This allows passengers to keep belongings out of the cabin space for maximum interior spacing while under way. The RAM ProMaster mobility van comes with a full 17″ or 32″ LED-LCD HDTV, Blu-Ray Player, and added surround sound speakers. With a 6’4″ interior height, the TV is conveniently attached to the ceiling offering easy access from front to rear. When purchasing a RAM van from us, we assist you in all areas of the purchase process. From gathering shopping information, financing options, and nation wide delivery, our van dealership will provide a hassle free experience. You can choose to fly or drive to us to pick up your van, or we can have it shipped right to your doorstep! Delivery may not be as much as you think, and we may be able to work with you to make it even more affordable.